Recent and historic photographs as well as the railroad history of the Thomas Viaduct and the surrounding area of Relay, Maryland. **ATTENTION**This is an ongoing project. I continue to add photographs and historic items of interest as I come across them. 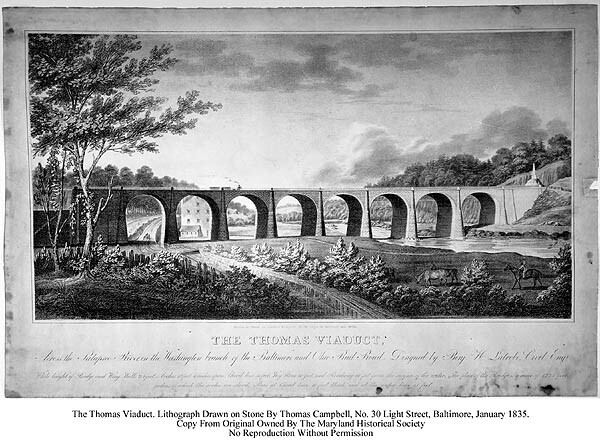 If anyone has old photos, interesting facts, or stories relating to the Thomas Viaduct, the Viaduct Hotel, or the surrounding area of Relay I would be very interested in them. My e-mail address is neutronfan@yahoo.com. Thanks. 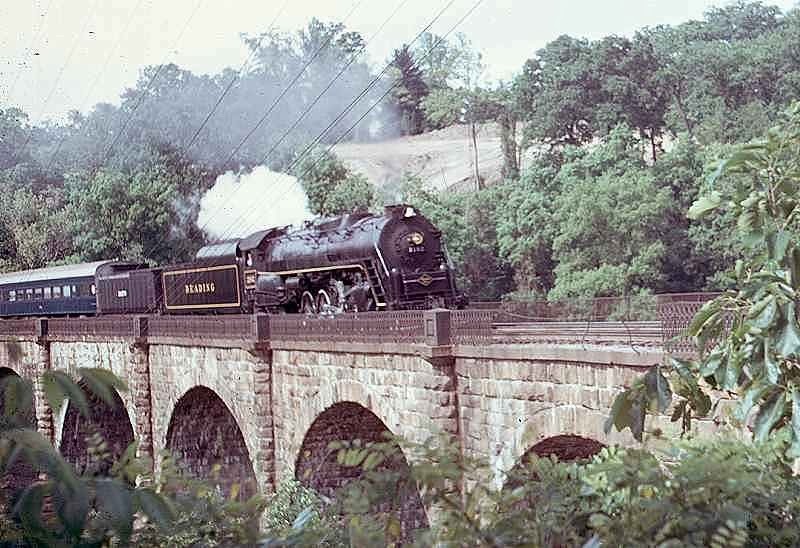 The Thomas Viaduct - Elkridge end of the bridge 1970. Courtesy, The Library of Congress by William Edmund Barrett. The Thomas Viaduct is a stone masonry railroad bridge that spans the Patapsco River and the Patapsco Valley gorge between the towns of Relay and Elkridge, Maryland and is the first multispan masonry bridge constructed in the United States to be built on a curve. 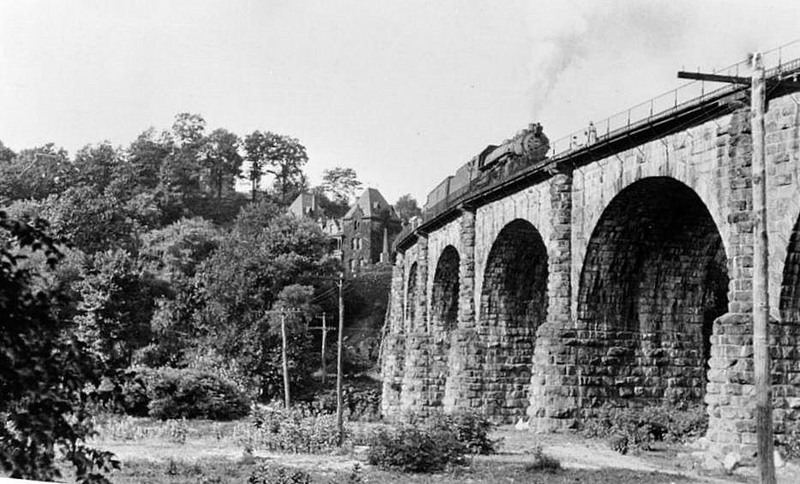 It is the world's second oldest railroad bridge still in use (the oldest is the Carrollton Viaduct located a few miles north) and is the world's largest multiple arched stone railroad bridge built on a curve. 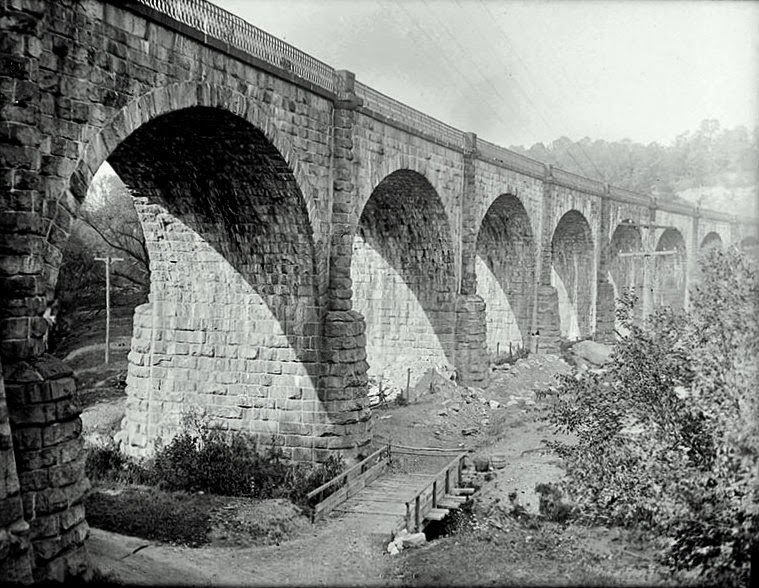 The Thomas Viaduct utilizes Roman-style stone arches using locally mined granite. 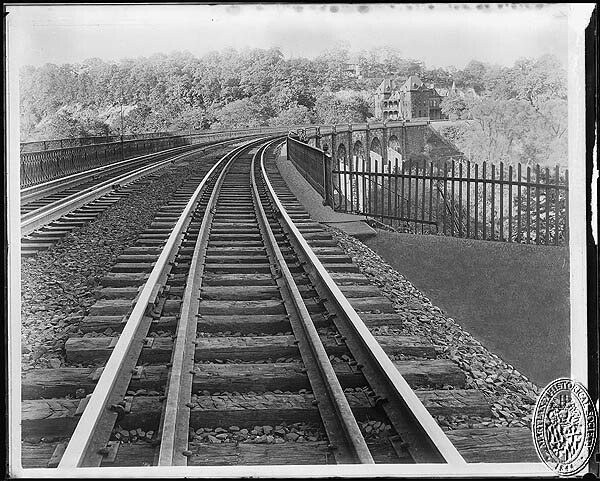 The bridge is made up of 8 spans totaling 612 feet in length and is approximately 26 feet wide and 59 feet high from water level to the base of the track rails. 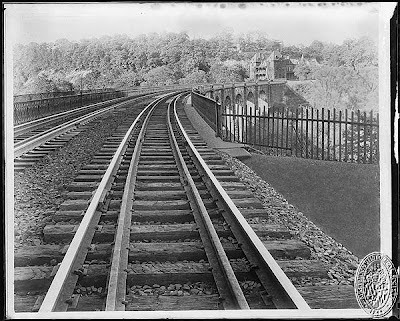 It is built on a 4 degree curve which is achieved by building the piers in a wedge-shaped manner. The Thomas Viaduct was designed by Benjamin Henry Latrobe II, then B&O's assistant engineer and who later became their chief engineer. Many at the time doubted whether Latrobe's design could even support itself much less the 6-7 ton locomotives being used at the time so they nicknamed the bridge "Latrobe's Folly". 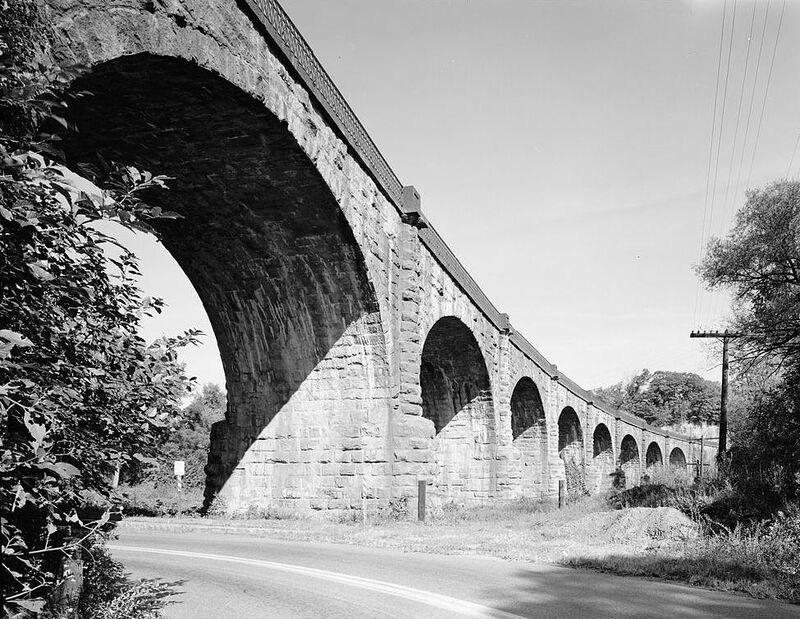 Benjamin Latrobe reportedly suffered from insomnia and nervous disorders as he designed and oversaw construction of the bridge including shortness of breath, fainting and indigestion. Conventional treatments of the day included bleeding, cupping, purging, and drinking turpentine! Morphine and laudanum were commonly used for insomnia. gives you a snapshot of how the area looked when the bridge was opened. flight staircase is barely visible on the left at the Elkridge end of the bridge. 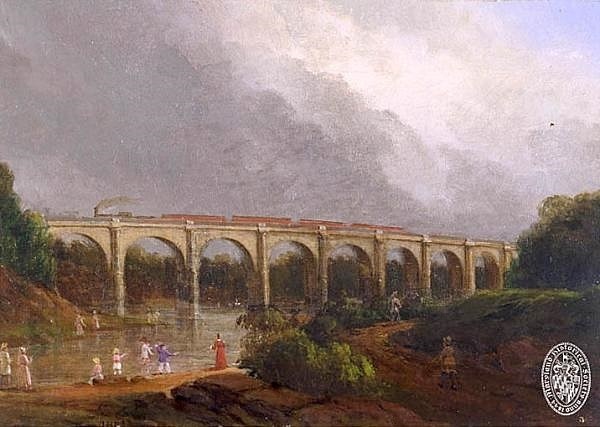 Construction began on July 4th, 1833 and the bridge was officially completed on July 4th, 1835 at a cost of approximately $200,000. 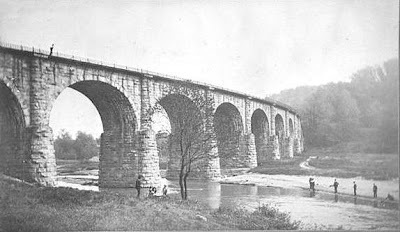 Over 600 stone masons and free black men worked on the bridge and set up a camp on the Patapsco flats just downstream from the bridge site. 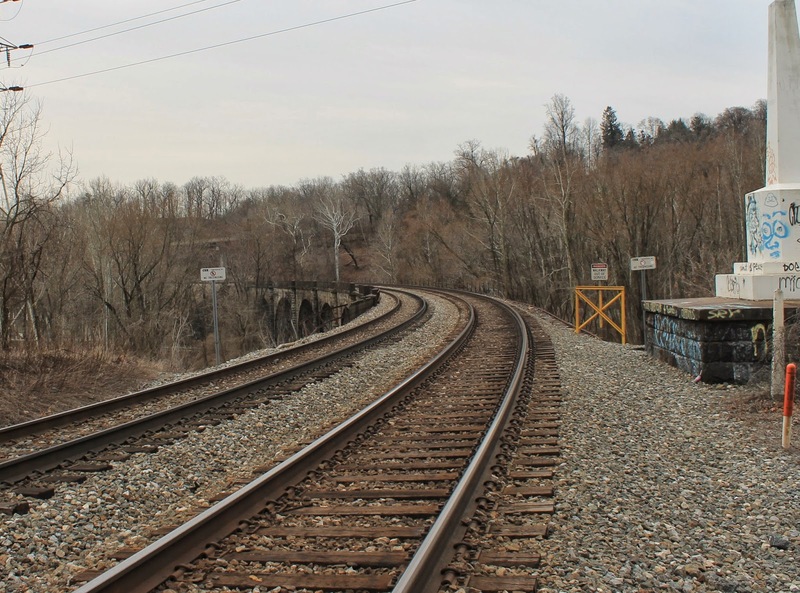 Locally mined granite from Ellicott's Mills was shipped via the Old Main Line on railroad cars and delivered right to the construction site. 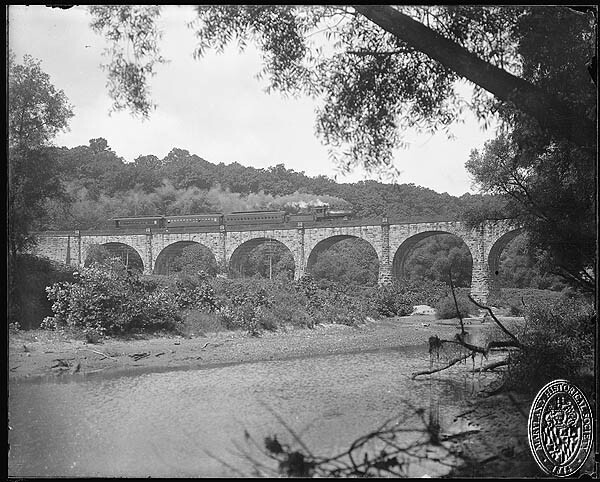 The bridge was named after Philip E. Thomas who was the first president of the Baltimore and Ohio Railroad (B&O). A 15 foot tall obelisk stands today on the Relay end of the bridge, designating government and railroad officials connected to the project. 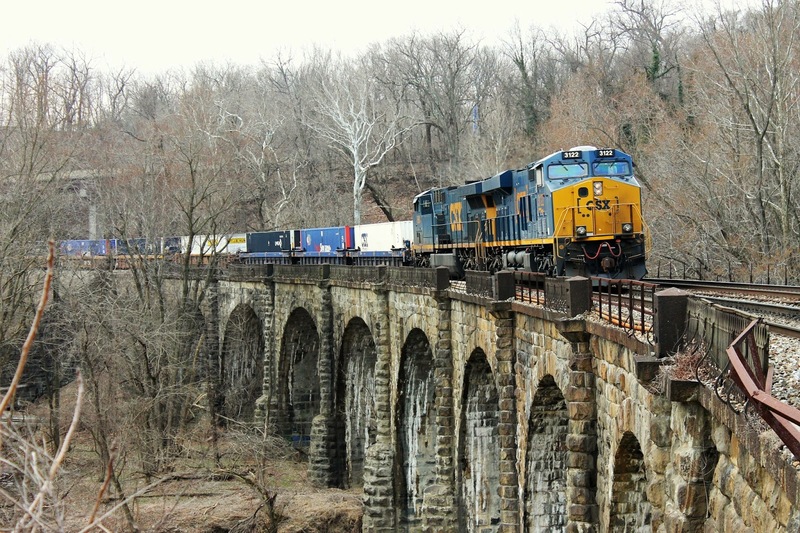 Today the bridge carries 200 ton diesel locomotives and heavy freight traffic on a daily basis. 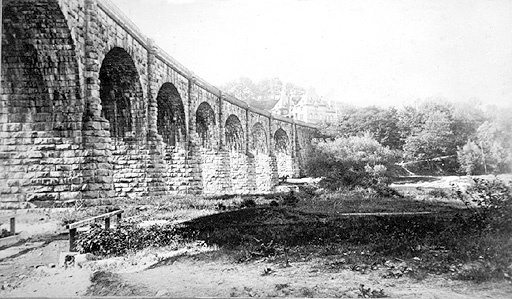 The Thomas Viaduct has been in service, without interruption, since the day that it was opened in 1835. It survived the great flood of 1868 as well as Hurricane Agnes in 1972, two floods that wiped out the Patapsco Valley and destroyed nearly everything in their path. 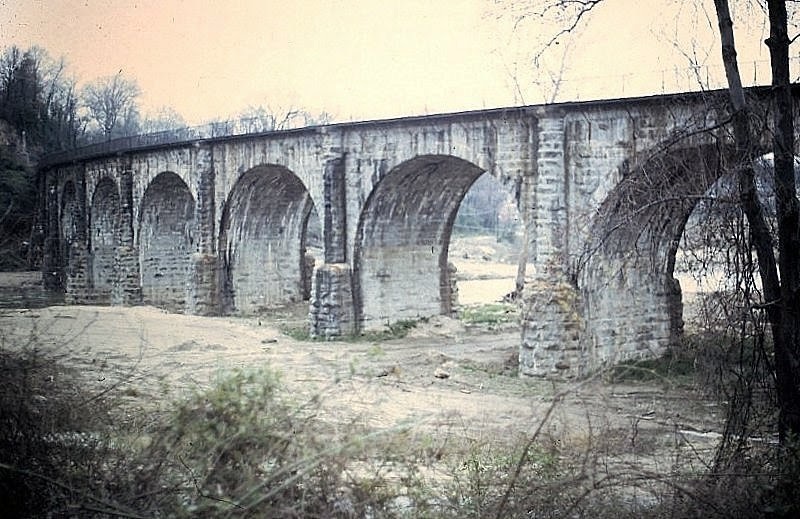 The Thomas Viaduct was designated a National Historic Landmark on January 28, 1964, and administratively listed on the National Register of Historic Places on October 15, 1966. The bridge has also been named a National Historic Civil Engineering Landmark by the American Society of Civil Engineers (ASCE). 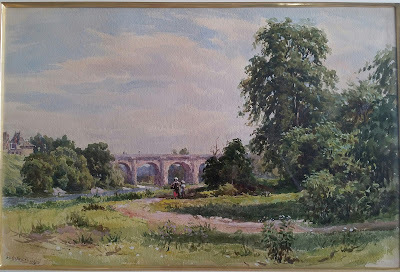 Oil painting by John H.B. Latrobe of the Thomas Viaduct circa 1850-1860. 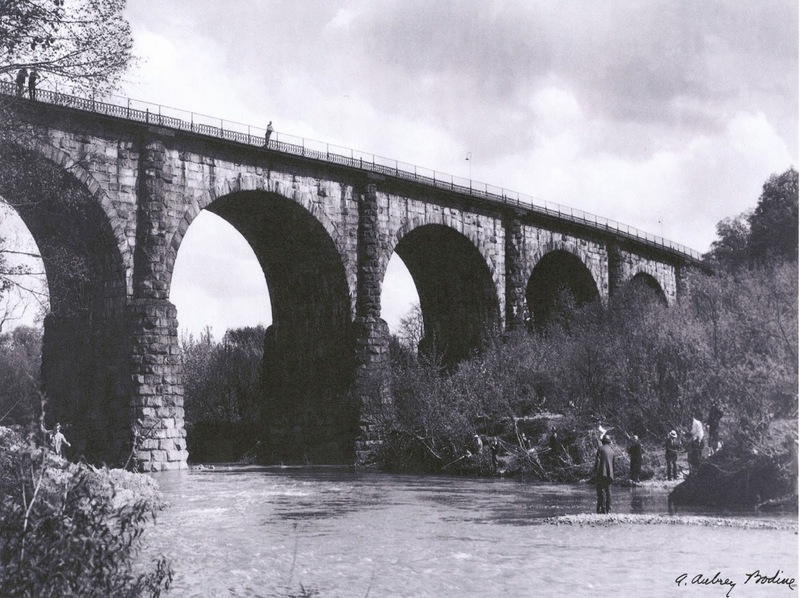 Courtesy of the Maryland Historical Society #1945-105-4.
bridge appear taller and a bit more graceful in it's overall appearance than it does today. It took me much longer than it should have to figure out why. 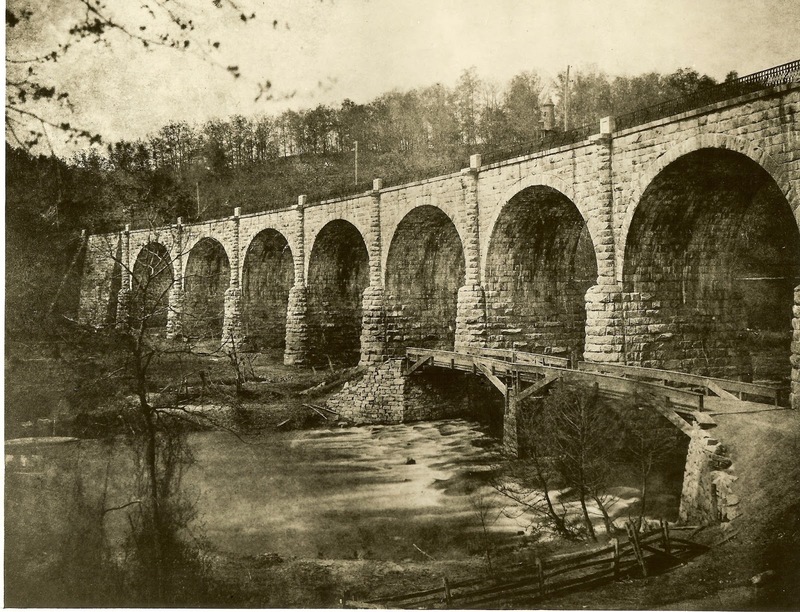 The Patapsco River gorge has silted up significantly over the past almost 2 centuries. The soil all around the the bridge piers is a spongy coarse sand in consistency. 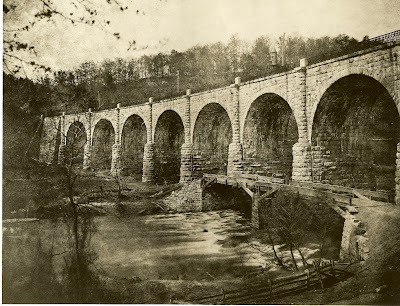 I counted the number of granite blocks above ground level on several different bridge piers and found that they are buried anywhere from 3-4 feet to as much as over 8+ feet deep in silt compared with photos of the same piers 130 years ago. This is nothing new though. 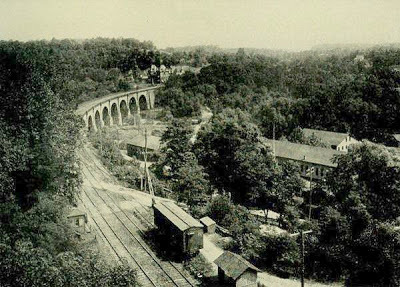 Elkridge Landing (now the town of Elkridge) was just a thousand yards downstream from the Thomas Viaduct. 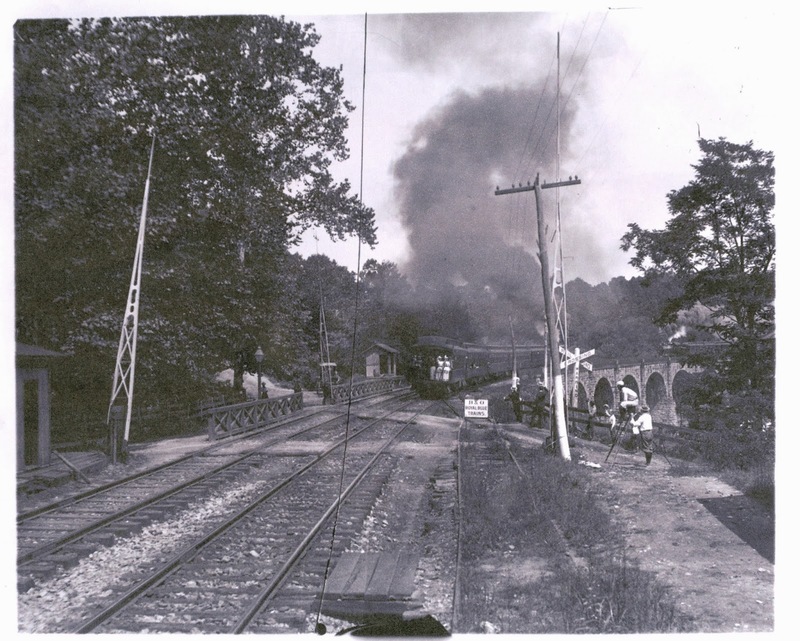 Two hundred and fifty years ago Elkridge Landing was a busy colonial river port rivaling old Annapolis. The river there was as wide as 500 feet across and 20 feet deep. 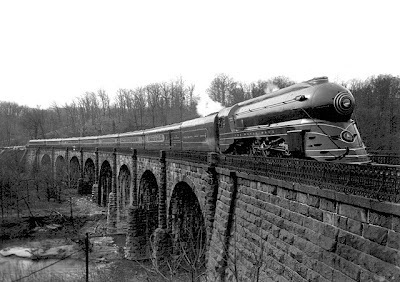 English ships sailed up the Patapsco river from Baltimore to pick up "hogsheads" of tobacco that were locally grown at the time. 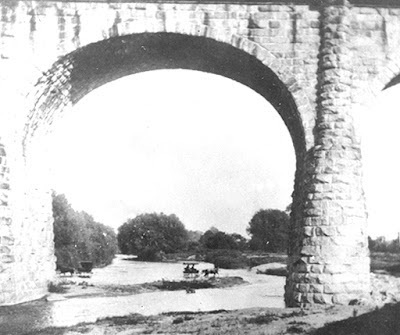 The river began to silt up due to ships dropping their ballast in the river before picking up cargo, mining and agriculture upriver, and occasional floods (known as "freshets") which finally made it impossible to navigate and the port ceased to exist. 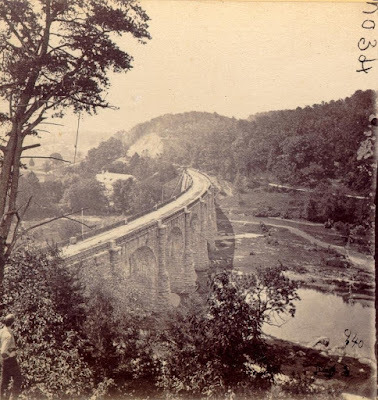 There was a small steamboat that was able to navigate up the Patapsco river as far as the Thomas Viaduct which stopped at a wharf just below the bridge. 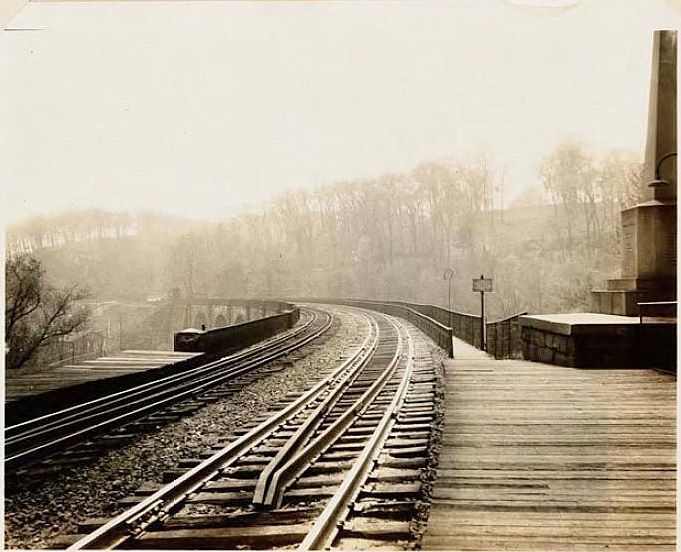 The 1868 flood wiped-out the wharf and filled in the steam boat channel with silt. Today, much of the river in the Elkridge/Relay area is little more than a shallow creek that couldn't accommodate anything larger than a row boat. 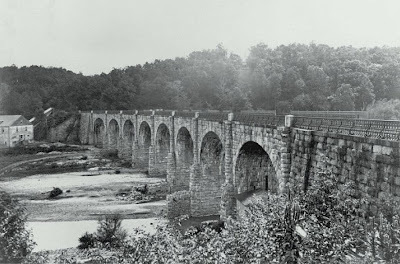 Also worth noting is that much less water flows down the Patapsco River today due to Liberty Reservoir and its 160 foot high dam that was completed in 1954. 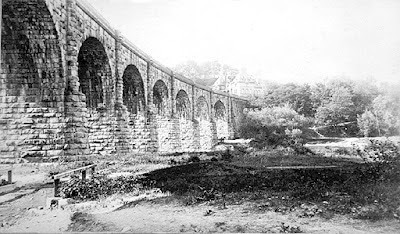 So if the Thomas Viaduct looks a little on the short and stubby side to you today, it actually is. Baltimore County Public Library Catonsville Branch. 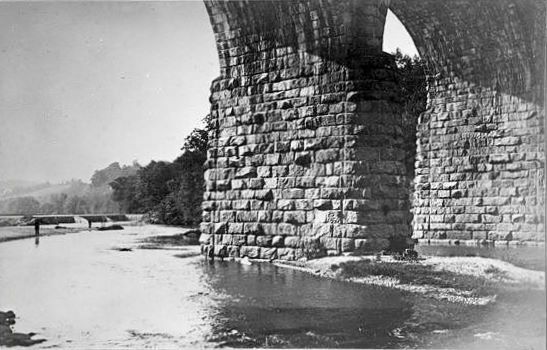 &/or 5th spans of the bridge today (counting from left to right). on the other side of the bridge. 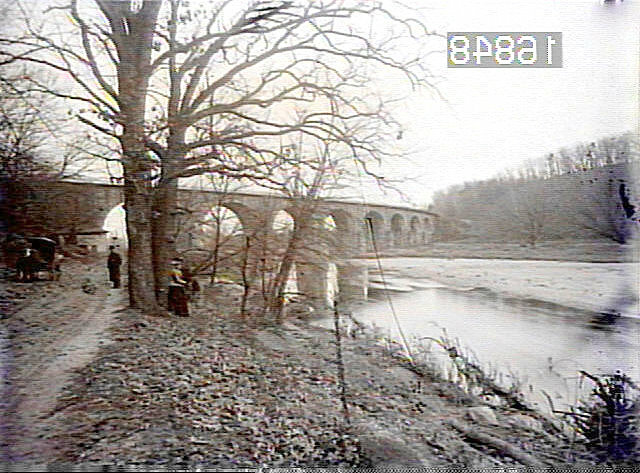 It burned down in 1883.
is from the flood. Photo by blog follower Walt Hiteshew. 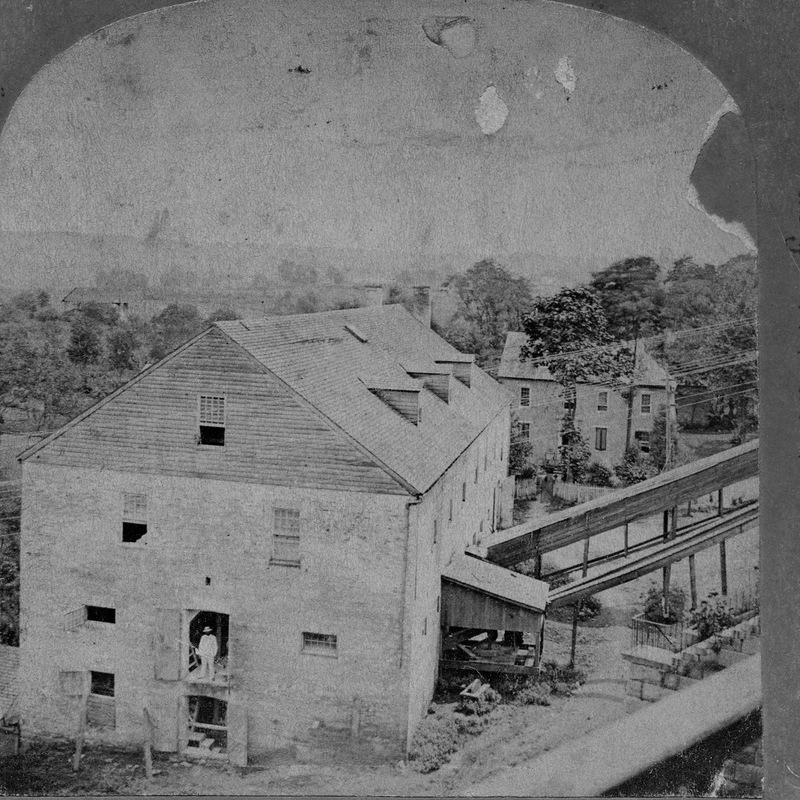 A close-up of the Hockley Grist Mill taken from the Thomas Viaduct. 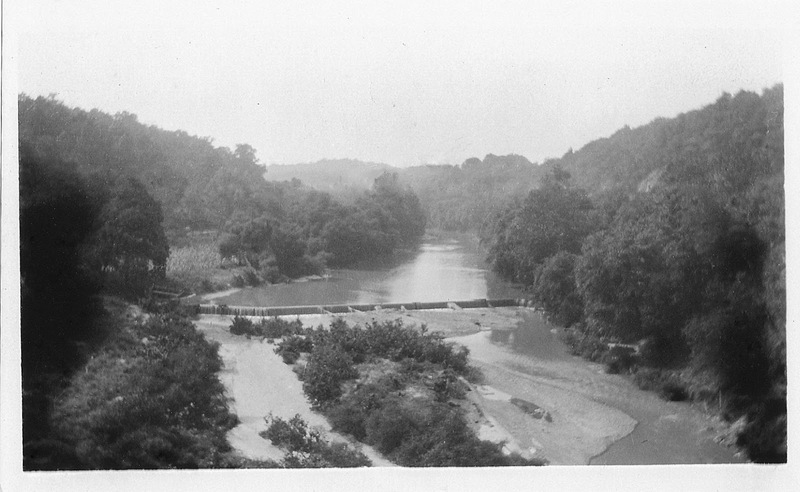 This one was taken from the same hilltop, circa 1890's - early1900's. 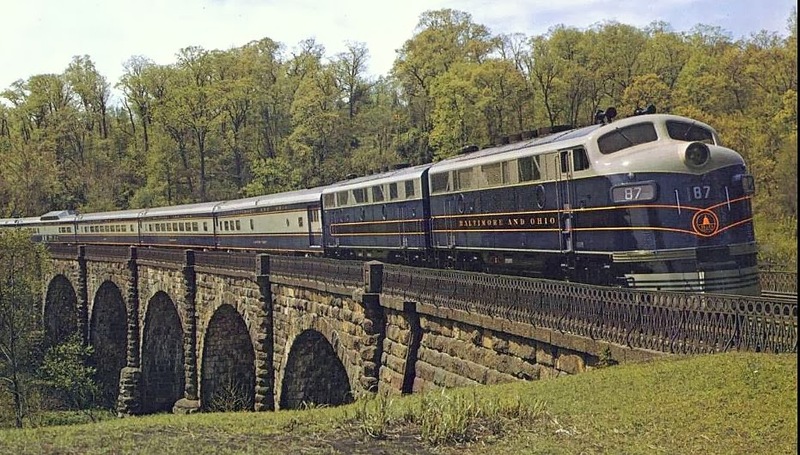 Photo is from an e-book of The Modern Railroad by Edward Hungerford. 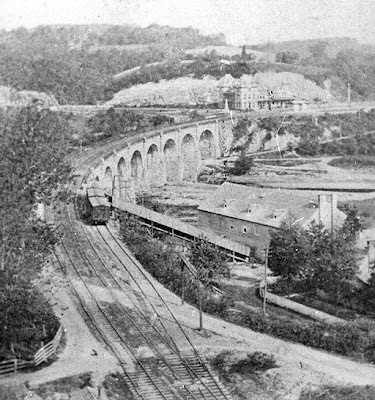 Viaduct Hotel train station in the background. professions. Their father, Edward Berge, was a well-known sculptor. 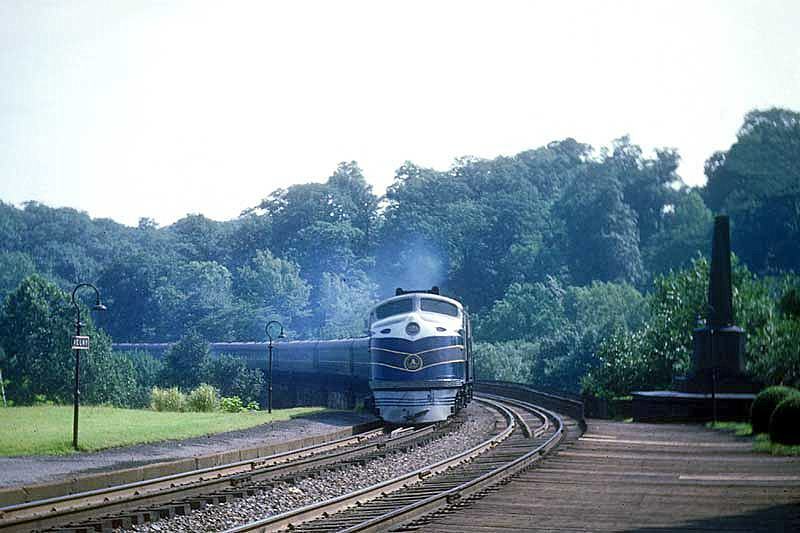 Elkridge Heritage Society - Sept. 12, 1989. 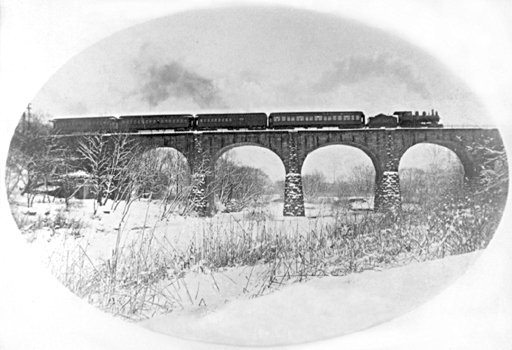 Thomas Viaduct with a passenger train after a snow storm in 1880. Courtesy of the Baltimore County Public Library Legacy Web project. A watercolor done by Baltimore artist Hugh Newell in 1885. Mr.
Jeff L. March 22, 2014.
no longer flows under the same spans as it did in the previous picture. Photograph by Jeff L. April 2011. 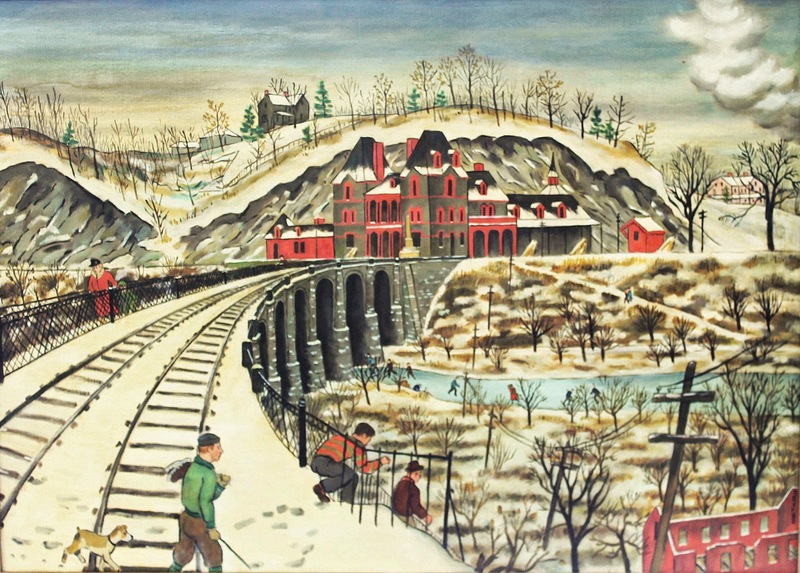 County Public Library Legacy Web project. Institution, Archives of American Gardens, Dr. G. Howard White, Jr.
Dr. G. Howard White, Jr. Collection. of the obelisk. A streetlamp is also visible just to the right of the obelisk. As it looks today with that obnoxious tower. train heading south over the bridge. Click on the photo to enlarge it. is still there but is little more than a wide trail going up the hill now. Thomas Viaduct with a steam engine pulling passenger cars 1925. 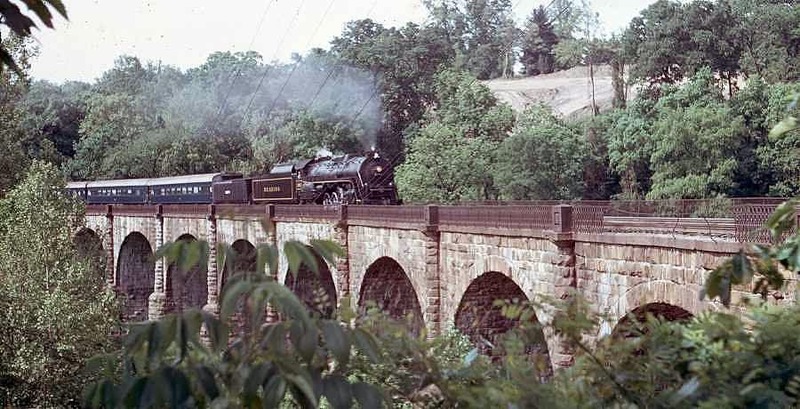 Photo courtesy of the Maryland Historical Society. 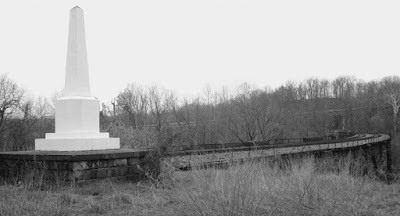 at the Builders Monument is visible with a streetlight and a sign. The same site as it appears today. 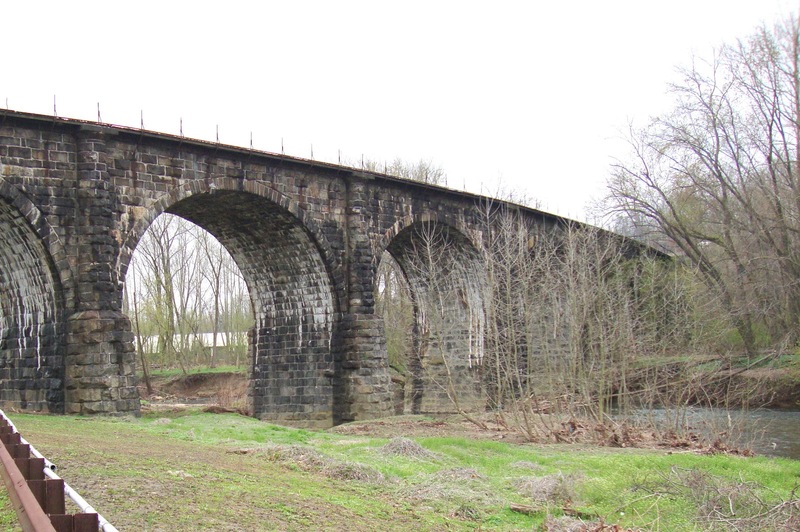 Photo taken March 2014 by Jeff L.
Jennifer B. Bodine, Courtesy of AAubreyBodine.com. 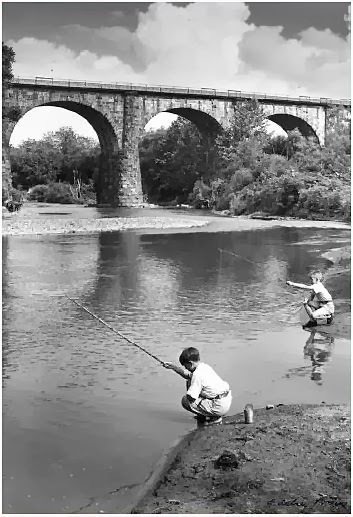 Children fishing upstream of the viaduct in 1935. 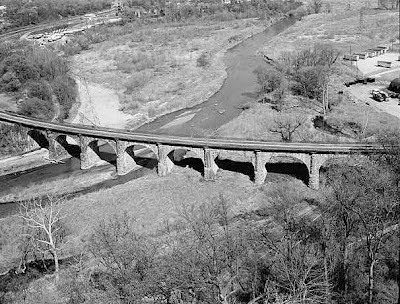 Looking upriver from the Thomas Viaduct walkway ca. 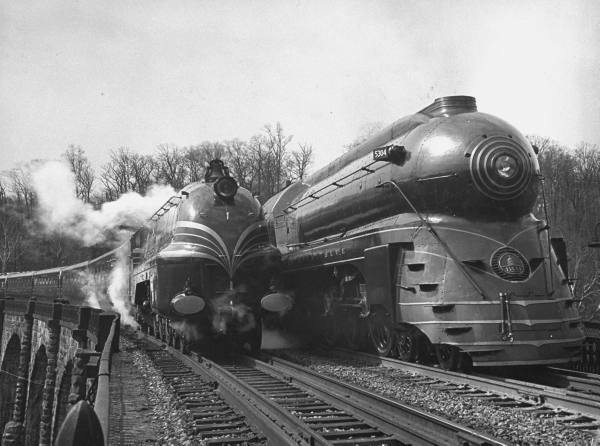 1920's-30's. Survey. Photo by E.H. Pickering. from around the bridge. 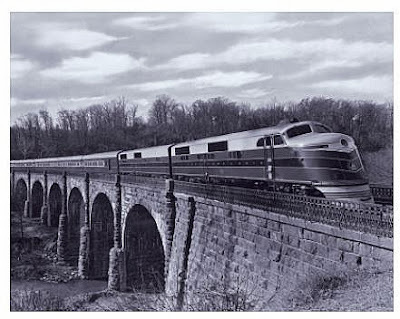 Photo by Jeff L., July 2012.
you will see 3 people on the bridge walkway in front of the train. 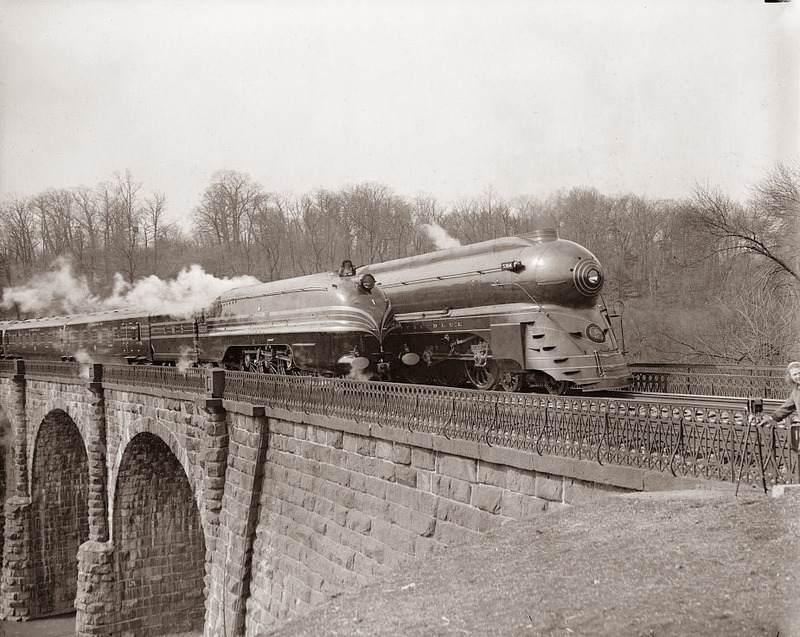 2 streamlined steam locomotives being photographed on the bridge in 1939.
circa 1950's. Photo B&O Railroad Museum. B&O's Columbian crossing the viaduct into Relay, 1949.
taken by blog follower Walt Hiteshew. Thanks for sharing Walt. 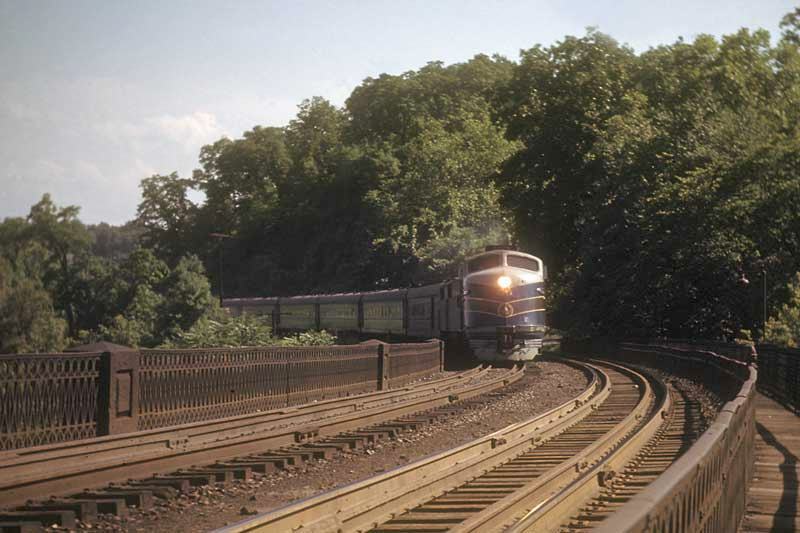 The next 2 color photographs were donated by Jim Kleeman. A widow that used to work for him gave him several slides taken by her late husband Jack Shields. Jack used to go out with a few buddies and photograph trains in the Baltimore area. 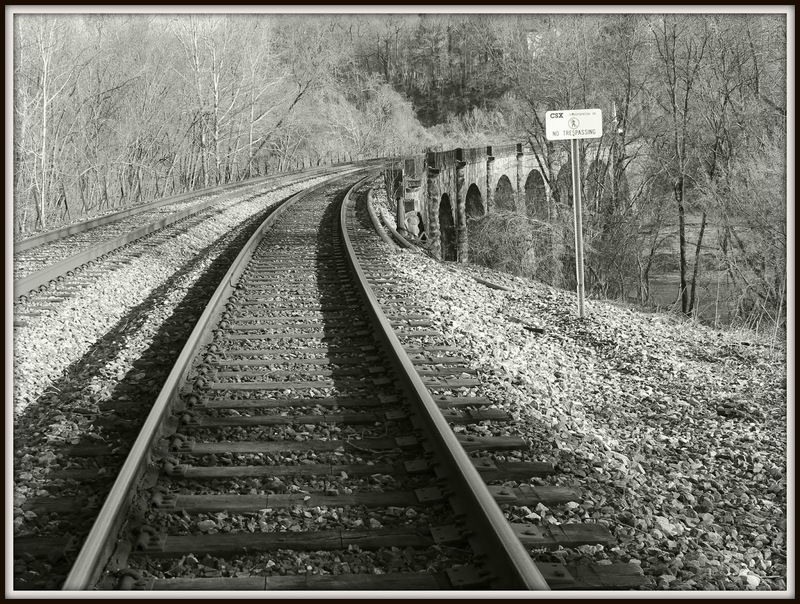 Thanks for sharing these great photos Jim. B.&O. 's Royal Blue 56 passes over the Thomas Viaduct circa 1950.
still cared enough to keep it looking nice for the train travelling public.